The day I started writing poetry was the day I slowed down. Well perhaps not literally. But maybe in a poetic way, I started seeing the world with the eyes of a “noticer”. There are days when life seems to go by at speeds that rival a BMW on the Autobahn. I know. But more and more I feel created by Artist God, Creator God, God of wild color and detail to participate in this world with all of my senses. The days I fail to notice feel lacking. As if I were closed off from creation. Removed in an ivory tower, imprisoned. One of my very own making. So I feel the nudges of gentle reminder to notice. I am so humbled that you are here. I sense your participation in this series and I am overwhelmed with gratitude. See I am blowing up gold and silver balloon, tying them with french ribboning of every color on the Autumnal side of the color wheel. And I am placing a hand-calligraphied name card on the tail end. This is a celebration, this noticing. Recently I sat and wrote a piece for a workshop I am participating in at Tweetspeak Poetry. I want to come alive in my seeing, my being present. I recently wrote a manifesto, my challenge to wake up, wash off the blurry portals with a huge roll of papertowels and a new bottle of Windex. Later in the series I will share “Throwing Off The Training Wheels of Noticing (A Manifesto). Perhaps a line or two there will resonate with you. Looking closely at everyday objects seems to be a big piece of the noticing puzzle. Can you challenge yourself to find a simple object of beauty, joy or simplicity in your otherwise whirling dervish day. Poetry slows me down as a child of God, as a writer and as savorer of beauty and simplicity. Here is my poetry. Here is my offering. Ready, set, go notice. Does play have time for us. 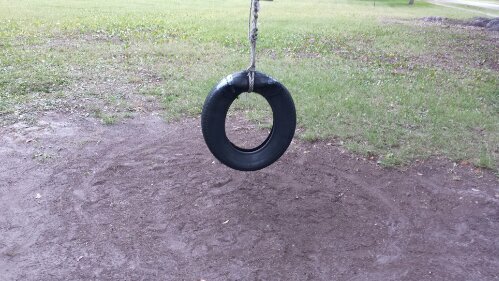 A tire swing as invitation to slow down and play, and notice, and live poetically! A delightful image captured in words (and digitally–great photo!). I want to LIVE my life, a participant, not a tourist. Thank you and thank Jeff. “…Suspending childhood…” for them. For me, especially. Maybe I should pull out the windex, wash the spots and blurs off my windows to see more and more along with you. always love the way I feel when I leave your space…all warm and full of home. I know that tire swing well. Beautiful rendering of words here Elizabeth. What a fun series.